Theatre Re’s The Nature of Forgetting comes promised as “a powerful, explosive and joyous theatre piece about what is left when memory and recollection are gone” as it heads to Worthing. The show, which visits the Connaught Theatre on May 10-11, combines actors, mimes and musicians and has been created in collaboration with UCL neuroscience professor Kate Jeffery. Inspiration came from interviews and workshops with organisations including the Alzheimer’s Society. Its aim has been to shine a light on issues around memory and so offer a new perspective. Katherine Graham, lighting designer and a core member of the company, said: “We very much work in collaboration, but obviously lighting is very important in how we tell the stories, how we articulate what we are saying. “This story is all to do with forgetting and to do with following this character whose memories are slipping away from him. The lighting helps us to tell the story from the outside and also sometimes to go inside his mind as well. “The show is connected with our previous show. Our previous show was about memory, and so now we started thinking about the opposite. “What happens when we forget? What happens when our memory is gone? We started with those questions with Guillaume Pigé, our director and performer. It was about finding ways of exploring this, and we also worked with Professor Kate Jeffery, and we were also speaking with people living with Alzheimer’s and dementia and with the people that care for them. “I think people really opened up with us and were interested in how we would portray these things. Art and literature talk a lot about memory, but we don’t talk a lot about forgetting, and the people were very, very generous with us in sharing their stories. “We are not necessarily telling their stories, but we are taking inspiration from them and using bits of their stories. As we were developing little pieces of the show, we invited the people that had helped us to come along to see it and to respond to it. “We are looking at the process of memory loss and how it happens. There is a process where your early memories flare up and come back to you and then get stuck and entangled in your mind before they slip away. We are watching that happen. We are watching memories flood into Tom and then get tangled and stuck and go. We are following it inside his mind, but we are also following his relationship with his adult daughter who is helping him. We are looking at what is left and we are seeing that what is left is the present. 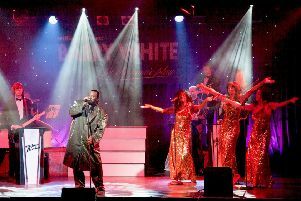 Tickets are available from Worthing Theatres box office on 01903 206206 and online at worthingtheatres.co.uk.